The long and winding road » 52 Weeks…….dare I return? Well that’s it, 52 weeks ago today was that fateful day when during a warm-up at rugby training I felt that dreaded snap. I’m considering going tonight…….not training in the full swing, but just hoping to get a good workout. How’s the wife doing, growing nicely? When is baby due? I’m going to see Flintoff’s physio (David Roberts) tomorrow afternoon, leg not so good, hopefully he can do something for me. He specialises in ankles etc. and achilles. Not looking forward to it but needs must. go for it dude. Matt Dunning (Wallaby Prop) just started playing club rugby again in Sydney a month ago, after suffering an ATR against the Baa-Baas at Wembley in December last year. 6 months from snapping his achilles to paclking scrums - impressive! Dan Carter also due back for the ABs next month after partial ATR in JAnuary. It can be done! Hopefully the physio can sort you out. I suppose you have to look at the long term gain if he recommends any further treatment. Do you think Matt Dunning’s rehab program model was devised by Alcester RFC? I’ve only attempted a gentle jog so far but fingers crossed. I think you’ll find the rehab protocols were designed by the Wallabies physio Jon! No offence to the Alcester lads or anything, but I think the Wallabies budget for that might be pretty impressive! What does your physio say? Keep in mind Dunning is packing down 8-900KG scrums, a hell of a lot of strain is going on that tendon!! To give you some idea in the difference of protocols…..when I ruptured my ATR the club physio/fixture secretary/general dogsbody established that I’d tripped myself up, given myself a bit of a dead leg and should try and jog it loose by doing a coulple of laps of the pitch. I’m an Aussie, so let’s hope the same dogsbody is advising Kevin Pieterson (at least until after the Ashes)…..just kidding. Maybe if you jogged around enough the tendon would magically reattach itself? Like you I’m at 52 weeks. Aged 60 but until a year ago a long distance runner and 3/4 times per week squash player. My achilles was completely severed with a 2cm gap. No operation, just plaster, horrible boot and physio. Quick progress for a few months then everything stalled. Still no push from the leg, considerable pain if I run (I’m up to about 3 miles but very slowly), difficulty in walking without a limp in ordinary shoes and generally despairing of the slow healing process. Alan~ Did I read you correctly? You didn’t have surgery? Surely they reattached your Tendon.I severed mine 95% and had surgery. Running 3 miles is awesome. I can’t wait to be there. Sorry you’re not making the progress you want. I was told I would be running in 6 months. I hope this isn’t a pipe dream…. btw~I’ll be 50 next March. I’m wondering the same thing. I was just operated on yesterday, but at 49, I’m wondering if perhaps the more intense sports should become history. I play lacrosse, tennis and basketball and am a triathlete. I think from now on I’m just a triathlete. Just not sure if the others are smart or worth it. Just wanted to let you know my good news. I got my cast off yesterday! Oh thank goodness, 9 weeks is too long in the Tx heat! Like wearing a dead animal on your foot…that’s all I’ll say about that…. The PA looked at my foot after the cast came off and told me it looked good. She didn’t know what kind of brace or boot I was to be fitted with. My Dr was in surgery. She came back and asked if we would mind waiting, because the Dr wanted to see me. I was worried…. He comes in and pushes both feet up, saying that’s great! Then feels of my tendon, he says, it feels strong, how does it feel to me. I told him I have no pain at all. He’s grinning from ear to ear! (This man never smiles) Then he tells me to go and walk. Swimming is good and riding my bike as a stationary. WOW! No brace, boot or PT! I just stood up and walked out!!!!!!!!!! My goal is to ride in the Hotter Than Hell 100 bike race next year. I’ll be doing some light jogging in 6 weeks if the Doc gives the ok. I attribute my speedy recovery to the prayers and well wishes of my family and friends. I’m trying to remain positve about being able to do what I was before the accident. At least I’m hoping. My plan is to take it slow and steady, lsten to my Dr and my ankle. The doc sugested the op so that I could return to my sports. He’s projecting an 80-90% recovery. He’s a good sports med guy and he clearly wants to get me out there again. I’m just not sure it’s worth the risk. I’m 49 years old. In addition to lacrosse and basketball, I enjoy triathlons, which bring very little risk of a re-rupture, so I may just focus on that. The start-stop stuff may have to go. Reading about 2nd and 3rd ruptures … can’t even imagine who low that would get you. tomingeorgia~I was not a swimmer or cyclist. but will be doing these sports as part of my rehab. It was my idea. The Doc said it sounded good, so I’m starting with swimming and soon as I feel stronger, the bike. If I’m not able to run as I did, I can still compete. With mine being an accident everything happen so fast that I had no choice. Surgery ASAP was obvious. If I had this happen again, Id give up sports! It has not been fun…….or maybe I’m just not that tough. Do you have any pain now? Hope you’re doing ok. I guess we’ll have MORE than enough time to decide what to do after we’re healed. I want to be smart - at almost 50, one could make a very could case for transitioning to “smarter” sports anyway. Pain is good. I plan to go off the meds tomorrow (day 5). I feel pretty good so I don’t think that’ll be a problem. Speaking of variations, the “back to work” thing is odd too. I read one post from a guy out 7 weeks! I guess that makes sense if you don’t have a desk job (I do). I plan to go in tomorrow for a few hours and see how it goes. I was able to go back to work part time about 2 weeks post surgery. I’m florist/gardencenter owner. I couldn’t get into the green houses much, but the knee walker was great for handling customers in the store. I did sit with my foot on the desk as much as possible. Be careful! I was went to the Dr last Thusrday 10-29-09. Was told not to come back!!! YEAH! I can begin running on the treadmill@ 4mph. $4 weeks earlier than I was told.This morning I ran a mile!!! No pain or swell, will stay at 1 mile for the next 2 weeks, I have had no limp for the past 2 months. I can lift on my toes over 3 inches. Looks like I am on my way to running again!!! Woooo Hooo! I have been back at work standing 12 hours a day. Just some stiffness in the morning until I get the tendon warmed up. I have noticed that I have more flexibility in the ankle on the injured leg…weird. The only problem is that my shoes cut into the place I cut the ankle, I have some stinging, but tolorable. I think the good thing about cutting the tendon instead of ruturing is that there wasn;t any shredded tendon cut away and I didn’t have to stretch to lengthen it. Beyond agitating for faster rehabs, my main job here seems to be bringing up the topic of the too-long tendon, something the docs and PTs rarely seem to bring up until it is too late. When you said your injured ankle is more flexible than the other one, that’s a red flag for that problem. By more flexible, do you mean that that you can dorsiflex (bring your toes up) farther on the injured side? That, in and of itself, is no problem. The real question is whether or not you have calf weakness at the plantarflexed (toes down) end. To test for this, cross your injured ankle over your other knee. Then push your toes down, using your calf muscle, as far as they will go. Keeping the calf pushing down firmly, grab your injured foot with your hand, and see if you can wiggle the foot up and down a little before the calf “catches.” That is, is there a very weak, abnormal-feeling area at the very plantarflexed end of your ankle’s range of motion? If there is, you have a too-long tendon. If not, you don’t have that problem, but I wouldn’t risk stretching it any further, either. Thanks for telling me about this longer tendon problem. My husband noticed that there’s a difference of flexiblity in my ankles in the dorsiflex. I did the test you told me to and there is no movement when I try to pull the toes up. I never did any stretching of the injured tendon. Just wrote my ABCs with my foot and swam laps, so I find it odd that the tendon is longer. It’s been hard to compare my recovery to others since I have only found one other on this blog who cut their tendon as I did.That person didn’t give many detsils of their progress. I do think I have progressed well. It’s only been 5 months and am at the point I thought was never going to come! It’s been hard to hold myself back and not do too much too soon. I am riding my bike and still swimming. Never had PT, Dr just monitored my progress. He just told me not to over do it , cuz if I screw it up we’ll all be unhappy. Any advice will be appreciated. If you know of any others with a similar situation can you tell me where to look for their blogs. I get lost in this site…. so much information to shift through. Congratulations - there’s been a couple of achilles babies - Jimbo has also done the deed !! Congratulations to you and your wife on the great baby news. Wishing you all the best in the coming months. 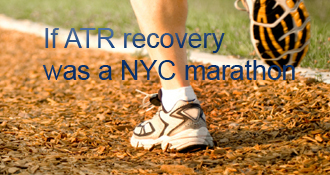 I didn’t sustain an ATR, but had surgery on my AT and heel on May 11. Still in a hard cast and NWB, but I hope that changes when I see the doctor on May 22. Continued good luck with your AT recovery. I did see that Bojinov scored, he deserves a bit of luck does that boy. As for the baby, the weeks seem to be flying by way too fast. That is fantastic news, hope Mum, you and baby will all be OK, it will be an early Christmas present for you. I’m still struggling a bit after 13 months, but I am just happy to be able to limp along. Did you know that Jimbo was a new Dad as well? This site is great for all sorts of reasons. Jimbo’s friend won 2 tickets to watch City in a Talk Sport competition so he sent them to me and I was able to give them to my niece and my cousin. Like you say, we are all family! Did you notice that Bojinov scored his first goal for us last week 10 months after his achilles rupture. Well done my boy! - 20 minutes on the blind side is beckoning !!!!! I had surgery on my achilles in August. I been back playing soccer (i am in the states) for about 3 weeks. I play competively in a men’s league. The achilles feels great and it is actually stronger than the other leg. I just need to stretch it out and warm up really well. Been very busy so not checked site for quite a while. Glad your OK, our Bojinov is supposed to be starting training again this week, like you say, its fine for professional footballers and all the experts around them. I’m still plodding along without any more great improvement, just glad I can still walk. Newcastle game tonight, what about Robinho!!! Bet he will be gone by the end of the season, too much Press attention on him here. Hows work down there, motor trade really suffering at the moment. My son starts a temporary job tomorrow, he has been out of work for 3 months now. Anyway, best of luck hope your progress albeit slow continues. I ruptured mine on July 17, 2008 - had surgery on July 23rd and have now played 6 competative Mixed Doubles tennis matches with very little problem - so I can definately see you getting back out there very soon. I am also able to run a couple of miles before I feel anything in the foot/leg and its mostly just a weak leg vs a strong one. Get back out there, go slow and give it a try and stretch it out very, very well before and after. Lucky you going away, make sure you don’t do anything foolish on holiday! ! I’m sure you will enjoy yourself. Don’t do what I did when we went to America some years ago, I ran into a closed patio door and broke my nose, didn’t go to hospital there though in case they kept me in or charged me loads, I just went to hospital when we got back home, the bad news was my nose couldn’t be fixed then but the more serious damage was to my neck where I now have 2 fused dscs. Anyway, enough of the gloom we should all be rejoicing in our improvements over the last few months. Like you I have just finished the DIY of our bedroom. I started it just before rupture so every night all I saw was this half decorated room, anyway its all done now, so I can sleep a little easier, it drove me mad looking at it. I’m almost 8 weeks post-op now and my therapist is also pushing me to do 1 legged heel lift. She’s saying this week. I’m having trouble doing two legged & getting a really tired right leg. I’ve been working flat on the ground and on the stairs. It’s taken me 8 weeks to get this far. I may just tell my therapist to slow up too. Rerupture keeps reverberating in my head. Don’t want to have that happen! Things are okay at the moment (fingers crossed), it’s a little different working in the design department as production doesn’t affect us usually, but thanks for asking. It’s a shame about your son; everyone seems to be on tenderhooks at the moment. Thanks for the responses on the heel lift, I thought the PT was pushing it expecting me to do a heel lift after only 7 weeks post cast. I’ll tell her to calm down next time. It may take a while. I am 22 weeks post op and currently lifting weights and/or running (up to six miles); riding my bike up to 33 miles; doing (two legged standing, seated, and leg press calf raises); and eating healthy. However, I can barely lift my heel one quarter of an inch of the ground (and that’s with body momentum). You may have quicker results, but doing a one legged heel lift generally happens around the six month mark. With that said, however, you can resume other physical activities before that (such as those mentioned above). Good luck and God bless!! I am 28 weeks and still cannot do it, I try each morning thinking today I will.. but no such luck. My surgeon said when you can lift up onto your toes is the day you are ‘cured’. On another note, how are things in the motor trade down there, keep seeing shorter working weeks etc. and laying off etc. Hope your job is OK.
My son is being made redundant at the end of the month, he works for a large Solicitors in Manchester in admin, and they are making 2 redundant, Alan had only been there six months so naturally he is first out. This crisis is getting very serious. There’s better advice on this site than in the majority of doctor’s offices. I was discharged from the hospital yesterday and was in an out in 15 minutes, he only did the thompsons test when I asked if he was going to check it. As everyone on here is/was in the same boat (more or less) they will know what you’re going through and will give a bit of thought to their advice and answers. My physio had me “jogging” up and down the gym hall this morning. She was very positive, though she guessed I had been skimping on the stretch exercises. Has suggested that I might try short runs as part of the physio. Week 16 conservative. My spam word today… goals…. is that a good omen for tonights game? Anyway, don’t be too surprised at NHS, even when it cost me £125 a visit (via my PPP Insurance) I was never more than 10 mintues with the surgeon. Last time I had been in and out before Martin had time to park the car!!! He told me to do whatever I felt comfortable with. Was never completely sure what that meant. As I have run out of outpatient cover now there will be no more visits to physio or surgeon until after Christmas when my fund is topped up again. Anyway, glad your doing well albeit under your own steam. I used hydrotherapy more initially. Shoulder level in water then practice walking on toes and heel raises. I’m at 15 weeks now and just swim. If you find regular pools are too cold and your ankle seizes up then go back to hydrotherapy but judging from your posts your leg is pretty strong so you might not get as good a workout at this stage. I prefer to just jog on the trampet now. I would pay the £24 a moth as well Jonathon, unless they doa minimum membership of 12 months then its a bit of a tough one. If youcan pay month by month then I’d do it. I too am wooried about the NHS physio when i enventually get to that stage as I have heard its pretty poor by us. The NHS here would make you pay for your own amblumance! You’ll never get me out of the pool. I will be trying to worm out of my gym membership later. Think you would be wise to spend that £24 Jon. I would think the hydrotherapy pool would be good. My Aunt had 2 hip replacements a couple of years ago and that was part of the recovery treatment, paid for by NHS !! I am non-surgical, but I imagine that once the wound has healed that physio (or physical therapy) can begin as you shouldn’t then be able to re-open the wound. I started the day after my cast came off. I suppose once you’ve had a day or two to get used to not having a cast on they can start to work on you. I’ve had 5 physio sessions in 3 weeks and am coming along in leaps and bounds (metaphorically). I’d recommend it if you want to speed up your recovery. Sounds like you’re making great progress! When did you start getting physio, is that physical therapy? How long do people usually get physio or physical therapy post operation? Glad all is going to plan, I am just about to do the exercises you sent me yesterday. I did them again last night and my thigh muscles really hurt, so I presume something good is happening. My anti-spam word this morning was goals!!! Don’t even mention last night!! Back to normal then. The long and winding road is proudly powered by WordPress and WPDesigner..